The "Call" Blog and Email for Funeral Directors: The “Call:” A church fan that can navigate, surf, email, text, call, scan and Google! The “Call:” A church fan that can navigate, surf, email, text, call, scan and Google! Take a look at this church fan. This funeral home has made this the most interactive church fan ever done. First, of course, you can travel to it (get to the funeral home physically), since the address is given. Second, you can surf to it, since it gives the funeral home’s website address. Third, you can email it, since the email address is given. Fourth, you can text it, since it has a keyword (Goolsby) that can be texted to the number 72727. Fifth, you can call the funeral home since the phone number is given. Sixth, you can scan it, since it has a QR code that will in turn, send a text message to mobilephones with a link to its’ mobile-website. And seventh, you can Google it, since the name of the funeral home is given. How many of these 7 things can your church fan do? Business owners spend a lot of time and money creating a web presence, but they forget a key element: How will people get there? Think of it this way - it’s like having a nice house in the country. The house may be very nice, but if it’s too far out and if you don‘t have roads, track and ports, you probably won’t get a lot of visitors. 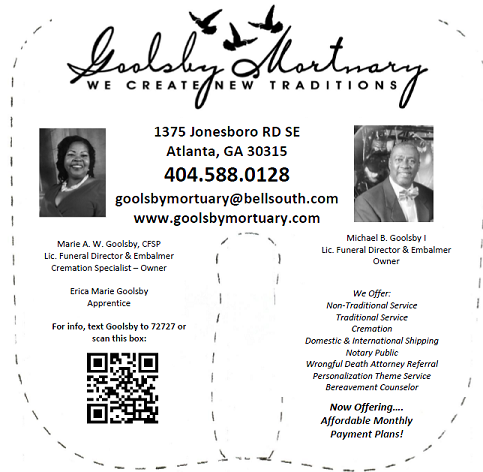 Or, think of this funeral home as New York: you can get to it by plane, train, automobile, ship, bus, etc… - Goolsby Mortuary gives you a lot of ways to interact with it. Goolsby Mortuary’s money was well spent on this church fan because it is very interactive. It’s a first-call generator. Is yours? Don’t you agree? Either way, we still would like to get your feelings on this subject. Click or tap The “Call” to go to our blog and post your comments! For a demo, text the term “Mobits” to the phone number 72727. Our contacts: phone, 786-763-1875, website, www.mobits.org, email, info@mobits.org. To demo a Mobits™ outside of the United States, type or copy the following link into a web browser on a mobile phone or device: http://bit.ly/1bgS4QJ. Or Skype us, username “Mobits.org.” Mobits™ can be done everywhere on the planet where there is internet access! International directors are welcome.